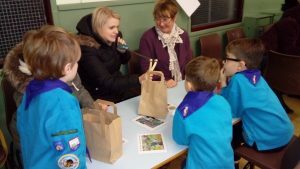 The two First Marke Barn Owl Scout Group Beaver packs helped Where the Wild Things Project by interviewing their grandparents about their childhoods. 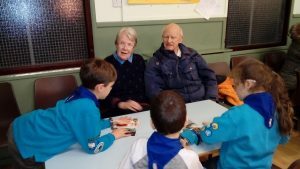 By using interview cards and items to prompt their grandparents memories the beavers found out a lot about the differences between childhoods now and then. 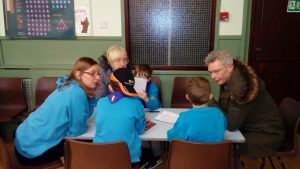 There was lots of lively discussion between the different generations and at the end each evening the beavers were asked to vote for which childhood would they prefer: now or then. It was a close call but most children preferred their childhood now. The adults all voted for childhoods then! The children were asked to write down what they found most interesting. These included: stealing apples, old money, no sweets for eight years (war time), making bogeys, building snow houses, going winkle picking, french skipping, kick a can and keeping budgies in a cage. Our thanks to the Beaver leaders for inviting us to join them for the evening and to all the grandparents who shared their memories.